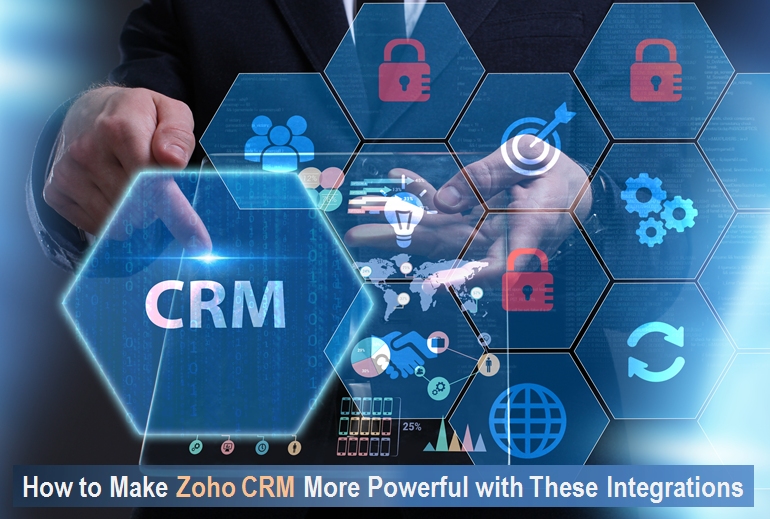 Zoho CRM is an on-demand Customer Relationship Management software that helps businesses of all sizes to manage their sales, marketing, and customer support processes in an efficient manner. Zoho streamlines and organizes all operations under a robust common platform. To support the requirements of small businesses and large businesses, Zoho CRM features a wide range of functionality. Zoho meets needs such as multi-channel communication, sales productivity, marketing automation, inventory management and much more. With the advancement in technology such as Artificial Intelligence and advanced analytics features, Zoho CRM helps you sell smarter, faster and better. Each integration helps you connect with powerful data rich platforms, creating valuable lifeline for your business. As each platform is connected centrally through your CRM, the integration eliminates information silos among different tools. Information accessed through integrated tools helps in creating effective content to better reach out to the target audience and deliver services that appeal to the existing customers with a more focused brand image. Integrated tools such as Google AdWords, Emails, and Campaigns provide you accurate contact information, previous interactions, and other advantages for managing your sales pipeline. Integration with advanced tools gives you an in-depth analysis of customer habits, tipping you about when is the right time to engage customers with your products and services. Pre-developed integration saves your organization substantial time and expense. Web Forms – Zoho CRM offers pre-built and customized web forms to convert your marketing campaigns into a lead generation machine. From landing pages to contact forms, it captures customer information in CRM. Campaigns – Zoho CRM is highly beneficial for your marketing team as it helps them to run campaigns, qualify leads, and transfer them to the sales team. If you want to get your marketing and sales teams working together, use CRM + Campaigns. Google Adwords – This tool gives you an overview of how much revenue your ad campaigns are generating. You will be able to keep a check on ad spend inside CRM, starting from the first click by a customer till your representative closes the deal. Trade Show Deals – It’s time to switch from card to button to access the contacts. All you have to do is scan a business card or QR badge to fill in the fields automatically and appropriately. This will help you save as either contact on your phone or as a lead in Zoho CRM. The integration of email marketing tools improves productivity. It informs your salesperson about the best ways to engage with your leads, prospects, and contacts. By combining the emails with contextual information and analytics, you can create your own powerful and personalized emails as per our own requirements. With the help of email marketing tool, all the customer information and the conversation done over emails get centralized inside Zoho CRM. The salesperson is also able to associate customer’s email conversation with CRM data such as leads, contacts and potentials. You can also share and update specific customer emails with other users within the account. You can also send and receive emails simultaneously in CRM and your favorite POP3 or IMAP enabled email client. The integration of advanced CRM analytics tools helps your business grow. With Zoho Reports, Analytics, and Forecasts, you can keep track of every sales activity and divide your sales goals into achievable targets. Sales Reporting – The intelligent sales reporting of Zoho CRM helps you manage the way your business is run. It breaks down key metrics relating to your sales trends, marketing campaigns, and team performance. From over 40 standards reports and create customized report from scratch. Analytics – The pre-defined dashboard views helps you keep track of every aspect of your sales cycle ranging from lead analytics to deal insights, activity stats, and email analytics anytime and anywhere. Create your own dashboards as well. Forecasting – You’d expect powerful forecasting capabilities in a robust CRM solution such as Zoho, and you get it! But Zoho goes a step above with out it relates emails and activities to your deals, giving you a 360 degree view of what is happening with your deals. Territory Management – If your sales team is spread across different geographies, the territory management helps you handle any form of customer segmentation. You can share accounts among territories, identify regions that made maximum profit, excellent customer service and so on. These are some of the reasons that Zoho refers to itself as THE OPERATING SYSTEM FOR BUSINESS – One platform for all an organization needs. 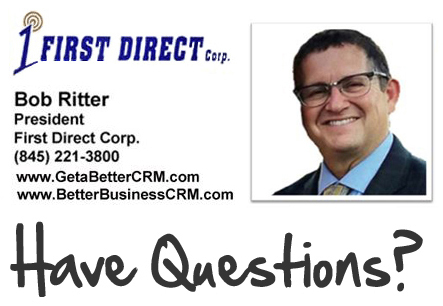 And, with the professional services of First Direct Corp., you can turn Zoho’s better business CRM software into a system that is aligned to your organizations processes and needs – all on one platform. First Direct Corporation is a Zoho Authorized Partner ON A MISSION to help you achieve better results in less time. Contact our Zoho experts at (845) 221-3800 today!